Wayne State University Press, 9780814317327, 524pp. tool designed to achieve proficiency at Latin in one year at the college level, two years at the high school or intermediate level. 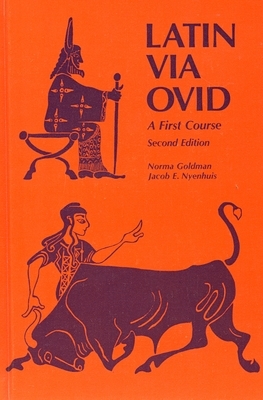 The volume provides students with imaginative, connected reading, beginning with introductory prose versions of Ovid's simple myth tales and progressing to the rich poetry of Ovidian Latin (with appropriate teaching aids) within forty lessons. The grammatical approach is traditional, but the central emphasis is on reading. In each chapter the reading appears first, followed by the vocabulary, the grammar, exercises, and etymology relating to the vocabulary. The exercises begin with a group of questions in Latin (based on the reading), to be answered in Latin. Each tale is preceded by a brief discussion in English of the story and its mythological significance. The myths retold by Ovid and the attractive format are conceived to impel the student into acquiring the skill to read the author in the original language. For additional complimentary materials on this topic, please see Latin Via Ovid Audio materials (available via downloadable flash drive and cassette tapes) by Norma Goldman and Jacob E. Nyenhuis and the accompanying text Practice, Practice: A Latin Via Ovid Workbook by Norma Goldman and Michael Rossi. Norma Goldman was an associate professor, instructor, and lecturer at Wayne State's Greek and Latin department for 48 years. She also authored a collection co-written with her husband Bernard M. Goldman called My Dura- Europos: The Letters of Susan M. Hopkins, 1927-1935 (Wayne State University Press, 2011).Jacob E. Nyenhuis was professor emeritus of Classics and Provost emeritus at Hope College. A former professor and chair at Wayne State University, he is author of Myth and the Creative Process: Michael Ayrton and the Myth of Daedalus (Wayne State University Press, 2003).